The attractiveness of a country for foreign direct investors stems from domestic factors but also from its interconnectedness with the global economy. 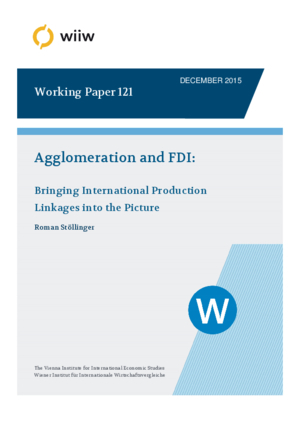 While knowledge spillovers and domestic inter-industry linkages have been examined by the literature on FDI location, international linkages have been neglected due to data constraints. Using global input-output data, this paper investigates the role of backward and forward production linkages between countries for location choices of first-time greenfield FDI investors in the EU along with traditional agglomeration forces. In line with the literature it is found that firms tend to co-locate with other firms from the same country and industry. Most importantly, inter-industry linkages between the source and the host country emerge as an important attraction factor while the same does not hold for domestic inter-industry linkages.